This is it! Enjoy the rolling hills and beautiful sunsets of Montverde living with NO HOA. Walk in to high vaulted ceilings and a spacious living room that leads into the newly updated kitchen. With 3 bedrooms and 2 bathrooms and 1,340 square feet, this home is cozy yet spacious. Enjoy the convenience of a stellar location and the privacy of being tucked away in a quiet community. The large screened in-porch situated on an oversized lot gives plenty of options to enjoy the outdoors. 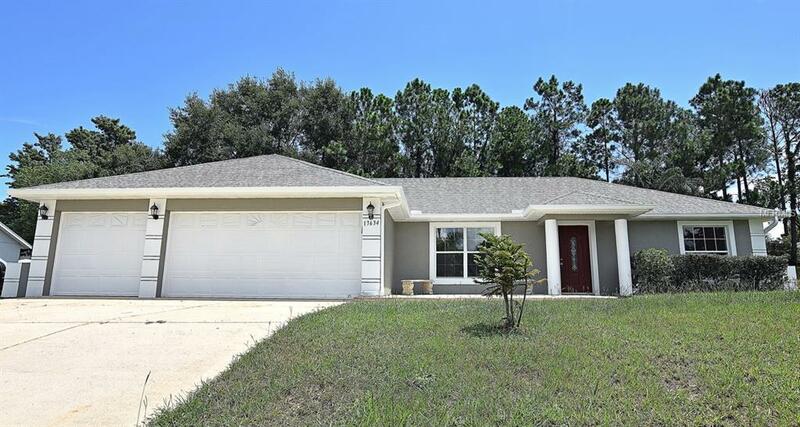 Brand new stainless steel appliances, new flooring in rooms, fresh interior and exterior paint along with all new lighting fixtures give this home a modern touch. Large 3 car garage. NO REAR NEIGHBORS. Come see this one of a kind home today before its gone! This one wont be around for long. Listing provided courtesy of Re/Max Neighborhood Pros.